Protesters block 51st Street and Wentworth Avenue during a protest at the Wentworth Police District station Thursday night. CHICAGO — Activists protesting police brutality and honoring Alton Sterling and Philando Castile shut down streets across the city Thursday night, including the Dan Ryan Expy. Southbound lanes were briefly blocked by dozens of protesters, who dispersed shortly after 7 p.m. to continue their march. 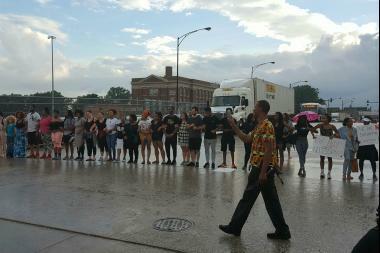 Activists then blocked the intersection of 51st Street and Wentworth Avenue, locking arms and chanting. A separate protest, also to raise awareness of police brutality and to honor Sterling and Castile, shut down part of North Michigan Avenue as well. Sterling, a black man, was shot and killed by a police officer Tuesday in a controversial case in Baton Rouge, La. Castile, who is black, also was shot and killed Wednesday by a police officer in Falcon Heights, Minn. Videos of the shootings and aftermath have gone viral. Deztinee Geigger, a Pilsen resident, attended the protest at the Wentworth District police station, 5101 S. Wentworth Ave., against the wishes of her parents. She said the lives of black people should be taken more seriously by police. "People have their own problems and their own oppression, but black lives matter today," Geigger said. Geigger, 16, told DNAinfo that she did not see videos of the deaths of Sterling and Castile. "I've been crying since yesterday," Geigger said. "I didn't want to see another video of the death of a black person." Imani and Kristen, two Chicago college students home for the summer, put together the rally Thursday and expected 200-300 people to attend. "We're two college students fed up with constant murders of our people," Kristen said. "We know that police officers have the power to make this change. We plan to elicit that from them, whether it be peaceful or disruptive. We will try peaceful first." The two students told DNAinfo that the goal of the evening was to garner support from local police departments. "We're tired of their silence," said Kristen. "Their silence is taking the oppressor's side." Imani said that people need to see videos of the shootings of Sterling and Castile in order to galvanize the masses. "It's what made us fed up. This is proof of a murder," Imani said. "The officers won't be convicted because our bodies and our skin don't matter." Activists across the city frequently have held protests and memorials for people killed by Chicago police, including Rekia Boyd, Laquan McDonald and Ronnie Johnson.